Central Arkansas Weddings Start HERE! Black SWAG BAG for The First 100 Brides AND a Pink Girls Night Out Satin Sash. Bring your Soon to be Groom Too! Purchase tickets or pay cash at admissions. More fashions, more new ideas and more choices than you can imagine. With spectacular runway fashion shows and displays from the area's most trusted wedding professionals, you will find everything to make your wedding day extraordinary. Inviting all couples from central Arkansas! EXPERT ADVICE from the area's top wedding professionals. SAVE TIME by seeing everything that you will need for your wedding all under one roof. SAVE ON COST with discounts and offers especially for show attendees. First 100 Brides in line will receive 1 Black Swag Bag, Girls Night Out Pink Satin Sash and a FREE $200.00 Gift from Symbolize it. ArkansasBride Magazine will be available too! Brides can register to win thousands of dollars in gifts and prizes, including a honeymoon cruise. Volunteer to particpate in our series of fun exciting contest '' Ultimate Wedding Challenge'' which includes Battle of the Brides, Kiss the Bride Kissing Contest, Kiss the Bride Cake Dive, Dancing with your Bride and more! Come and support your future bride. 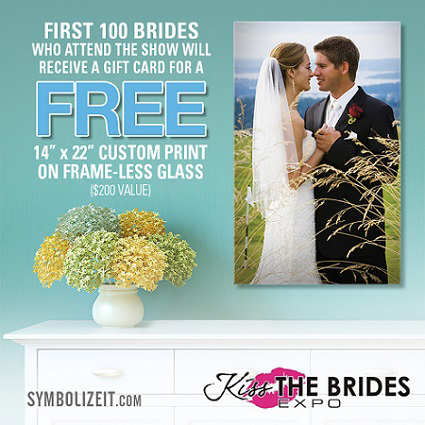 Whether you are just starting your planning, finishing up the last details, or anywhere in between, you will find exactly what you are looking for at the Kiss the Brides Expo. Register attend today! Arrive EARLY. Complete the form below to get your FREE copy of the Wedding Info Kit. We'll also email you a $2 Discount Coupon for ticket purchases at the door.